I really do enjoy your post and understand that most schools are facing the challenging balance of providing meals with tight budget constraints. I work in the corrections industry; however, I do not work for the food service side of things. But I must say looking at the food that your students are served and thinking back to some of the trays I've seen our "Guest" served, overall the trays for the prisons look more appetizing and filling. I know our food service has their meals that look down right gross but overall I would think they beat what you are served. Now we actually house federal "guest" and I know I have heard comments about those that transferred from local county facilities how horrible the counties food was. Also we use real trays, cups and of course sporks. But I doubt they lock down your lunchroom if they can't account for a spork. Keep up the fight and I look forward to reading more post. Oddly, pizza was one of the highlights when I was in school. Hamburgers, on the other hand, I refused to eat. Sorry about the pizza – I felt bad for you as soon as I saw the picture. the shininess of the pizza is awful. when i was in elementary school, we had pizza every other friday. it was brought in from Little Ceaser's, so I don't think it was that bad, however I never ate it. The lines were longest on those days though. This "meal" is a sad excuse for a lunch. Anonymous' comment about cafeteria food looking worse than inmates' food saddens me more than a little. Could you bring on a guest blogger from the corrections department? I'd be curious if they have similar nutritional guides or how they decided what's being served at all. I'd assume some serious psychology goes into it. Don't incite the prisoners you know? In school me and my friends use to put salt on top of the pizza and let it soak up the grease before wiping it off with a napkin. 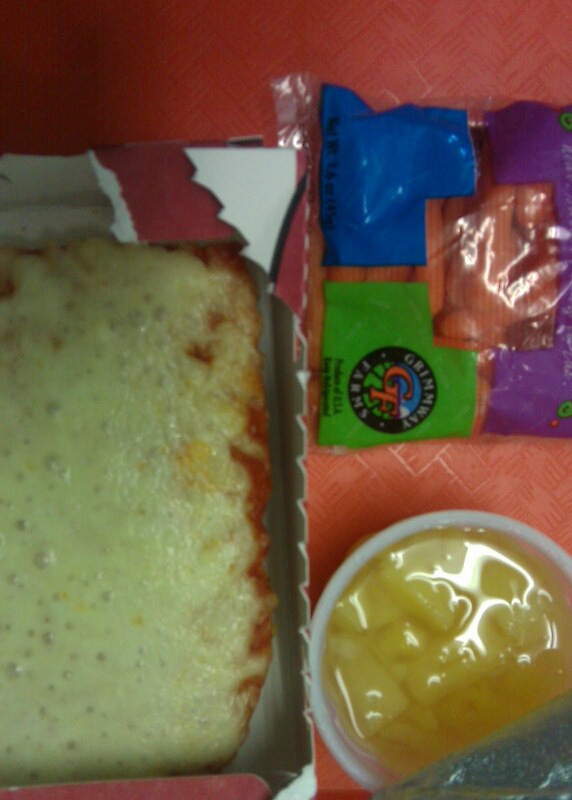 It was the only way the pizza was edible until they took salt out of cafeteria. That's supposed to be a pizza……..Looks like a block of drying out cheese. I really admire you're ability to endure this kind of diet for a year and am so fearful for today's kids who are eating it for years. School lunches are definitely something that needs to be changed. I just recently discovered your blog and I am really enjoying it. The thing that I can't get over is all the packaging. What a waste! I feel better about our school's lunch program after reading your posts. We do have pizza twice a month, but no other meal typically repeats in a month. There are more choices and food is served on reusable trays. Very little extra packaging. Back in the 80's when I was in elementary school, pizza was always a *special* lunch served 1-2 times a month and always ordered from a local pizza place (I think the school got some type of deal). They were the most popular lunch days and it certainly looked and tasted better than that. See? You're giving the impression that you're being forced to eat pizza every few days, when that's not the case. You've already mentioned that there are two options every day, yet you still choose pizza whenever it's available. I think you should explain why.